In my parental opinion, farm stays are great for kids as soon as they can toddle on their chubby little legs. I’ll never forget my son chasing chickens when he was about two, giggling and calling out (the chickens were in no danger of being caught, I promise). 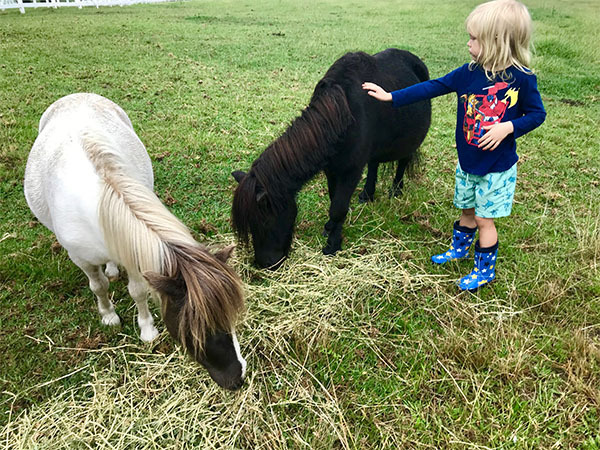 If you have two children (as I do), I recommend trying an equine farm stay. 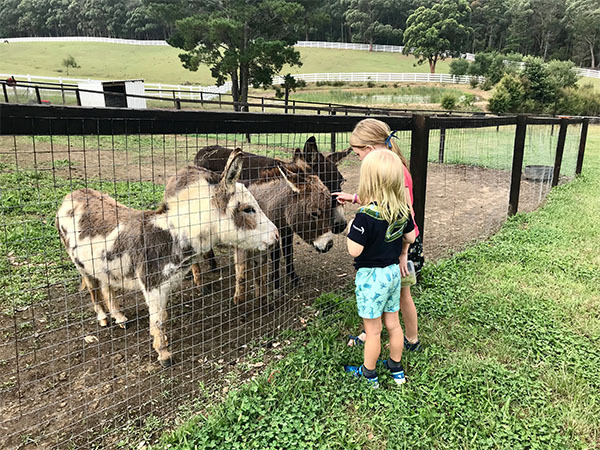 Recently I was the guest of the Eden Farm Escape in Bilpin, in the scenic Blue Mountains of New South Wales – a picturesque farm stay with cottages nestled in 90 acres of white fences, rolling fields and horses. Lots of horses. This farm stay had a lovely family-feel, and its origin story lends itself to that. 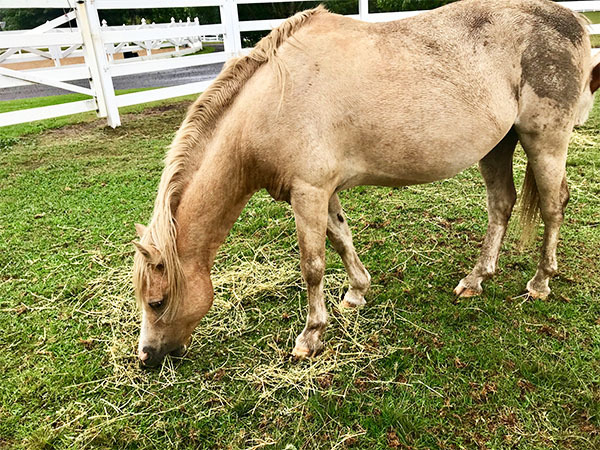 The two owners, Michael Cthurmer and Deborah Goodman, bought the farm stay after their son (who has Oppositional Defiance Disorder) responded well to equine therapy. His first horse, Beau, is one of the horses that children can pat and feed. All the animals here seem to have a story. Some have been rescued, like Sir Russell Pigsley the III – originally a piglet rescued by the RSPCA who is now a giant pig who loves to munch down on grapes. There are three toy donkeys – Shrek, Fiona and (of course) Donkey are all very happy for a pat and a feed. Then there are goats and a llama. While the younger ones can squeal in delight at the antics of Sir Russell, the older ones can enjoy the horses. We were all invited into the enclosure with the friendliest horses on the farm – Beau, Tinkerbell, Dash and Elvis. Beau was the largest horse, with the others all about the size of my five-year-old son. The kids got to feed them, pat them, and take Tinkerbell for a short walk around the property. My son was rather taken with Dash, though I’m not sure whether it was because he was exceedingly cute, or just very approachable because he is so small. 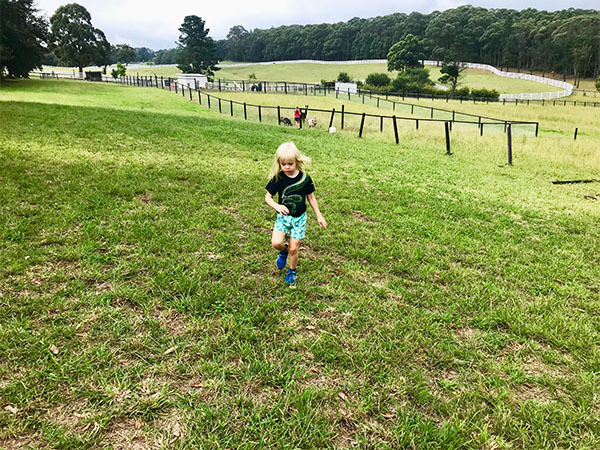 What I think families with children will love about an equine farm stay is that it gives children of all ages something to do. You can traipse around the property together or play with the smaller animals. You can chill out in your cabin with one child while the other goes for a riding lesson. At Eden Farm Escape they even have Fur Real horses (robotic horse toys) for really small children to play with while their bigger siblings have a go at the real thing. My son patting Elvis. Dash is eating food nearby. Eden Farm Escape has a lovely side-story. As well as horse riding, the owners offer equine therapy – the form of counselling that has worked wonders for the owners’ son. Some funds from the private renting of the cabins on the land will go to supporting a scholarship program for those who can’t afford equine therapy sessions. It’s nice to know that your enjoyment is helping support children with special needs. If you’d like to venture outside of the farm, Bilpin has a number of places you can go fruit picking, and the nearby Tutti Frutti café has wonderful soft ice cream made with real berries. 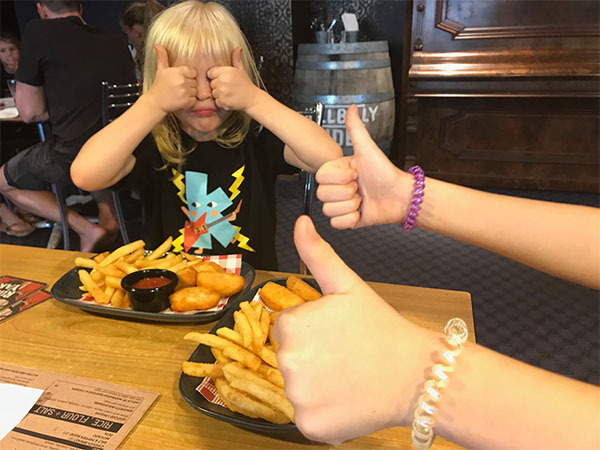 The local Archibald pub offers decent pub meals with a standard kids’ menu and good meals for adults. When it comes to weekends away, you can’t get much more fun than a farm stay. Especially in the colder months, many places will have a fire that you can snuggle down in front of. If this sounds like something you’d enjoy, grab your wellies, a bag of marshmallows and head for the rolling fields of Bilpin!